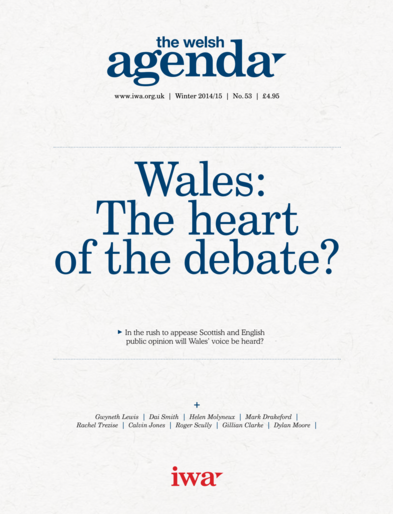 Home » News » Wales: The heart of the debate? Wales: The heart of the debate? Roger Scully draws some conclusions following the Scottish Referendum. Did Scotland say no, or just not yet? Eberhard Bort says change for the union must be forthcoming or the No vote on the 18th September will be nothing more than a reprieve. How can Wales be at the heart of the debate? Lee Waters says empty reassurances put Wales at risk of being left behind again. Joy Kent and Helen Molyneux debate the drive for gender equality among decision makers in Wales. Professor Calvin Jones argues that no place develops within a vacuum. Jennifer Owen-Adams looks at the potential impact of Teach First in Wales. Geraint Talfan Davies looks at the state of the arts in Wales in a challenging financial climate. Those in greatest need at the front of the queue. We look at the first two Senedd Papers. David Waite examins decentralisation across England and its implications for Wales. North Wales, a region without a City? David B Jones asks where a City Region agenda for South Wales leaves North Wales. Mike O’Neill and Nathan Davies debate whether the SEN reforms will work for Wales. English Nationalism- Friend or foe? Professor Gareth Rees questions the perception that the Welsh education system is under-performing. Rhian E. Jones revisits Blackwood for a festival of literature and music rooted in history, politics and the resurgence of Manic Street Preachers. Penny Thomas outlines the early success of a series that brings fun to the heart of the National Literacy Strategy. New Culture Editor Dylan looks at some of the latest Welsh book releases. Gerald Holtham looks back at Geraint Talfan Davies’ contribution as Chair of the IWA. Trevor Fishlock tells of the letters written by his Grandfather on the western front.